In Experiment 9 you used the H-Bridge to control a motor's direction and speed. The issue is that you had to hard code the direction and speed of your motor. Most applications that make use of a motor allow the user to control the speed and direction of the motor, much as you would your own car. In this experiment we will add two inputs and use them to control the direction and speed of your motor. Are you ready to get your motor running? Let's go! CAUTION: You will be using voltage that may be higher than the limit of the circuitry on your RedBoard allows! Make sure you keep motor voltage (MV) isolated from other circuitry! Accidentally using MV to power other circuitry may cause irreparable damage to your RedBoard! 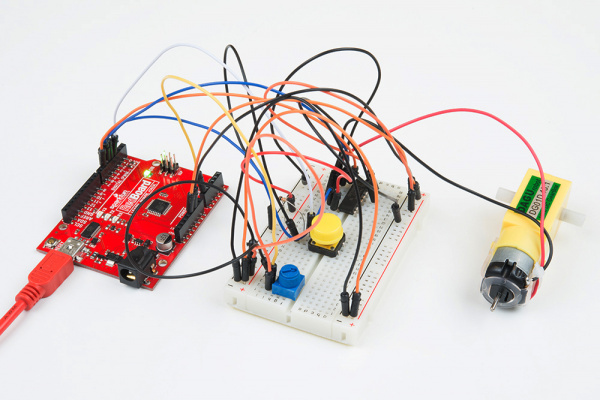 Use the inputs to manually set the direction and speed of a motor. //at a speed set by the speed variable. These big, scary functions take a single value as a parameter: speed. Each function then accepts that value and applies it to the analogWrite() function inside of the custom function. Custom functions are a great way to clean up your code and also make it more modular and useful in other applications. Watch out! You are halfway to writing your own library. 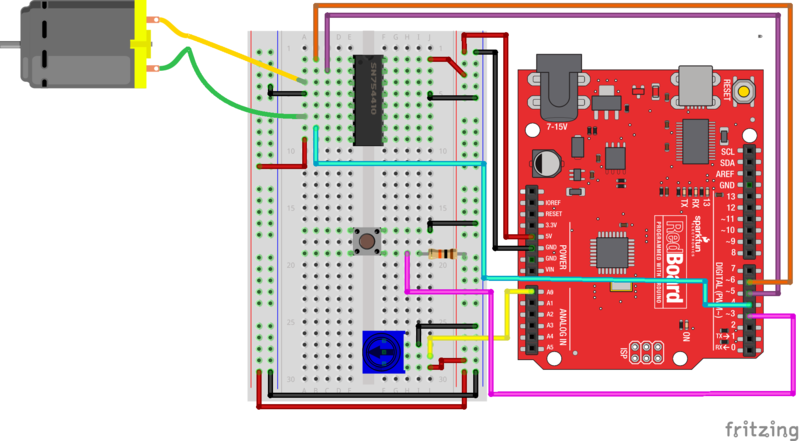 You should be able to control the motor's direction by flipping the SPDT switch and then the speed through the potentiometer. Go ahead and play with both inputs to make sure they both work and the motor is responding to those inputs. Double check the wiring of your switch, but also double check your if() statement to make sure there isn't a semicolon after the statement.